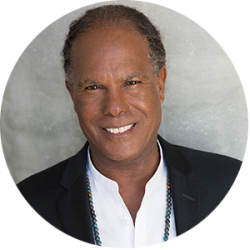 Why partner with Michael Beckwith? CEO and Founder, Gerard Armond Powell, was introduced to Reverend Michael Bernard Beckwith and started going to AGAPE following a difficult journey to finding true happiness. Through Reverend Beckwith’s teachings and the consistent support from Reverend Kathleen McNamara, Gerard experienced a breakthrough and for the first time in his life began to have hope. This hope was instrumental in creating the momentum needed to fully envision the Rythmia experience, which includes Reverend Beckwith’s life transformation teachings. The Answer Is You is an invitation to actively participate in unfolding your personal destiny. Reverend Beckwith personally teaches this workshop on-site two times a year and has fully trained practitioners who teach on-site every morning, Monday-Saturday. Whatever your question may be about “prosperity, purpose, health, relationships” the answer is you. The daily inspirational teachings and tools have been designed to help you transcend self-limiting beliefs and step into the flow of a universe waiting to support you in the expression of your highest self. This workshop will enable you to answer three critical questions that transform lives: How can I grow? What can I give? What can I celebrate? In 2012, Dr. Beckwith addressed the UN General Assembly during its annual World Interfaith Harmony Week. As co-founder and president of the Association for Global New Thought, he hosts conferences featuring harbingers of world peace including His Holiness the Dalai Lama, and had the distinguished honor of presenting to Nelson Mandela the Gandhi King Award. Dr. Beckwith is a sought after meditation teacher, conference speaker, and seminar leader on the Life Visioning Process. Three of his most recent books-Life Visioning, Spiritual Liberation, and TranscenDance Expanded are recipients of the prestigious Nautilus Award. He has appeared on the Oprah Winfrey Network’s SuperSoul Sunday, SuperSoul Sessions, and Help Desk; Dr. Oz; The Oprah Show; Larry King Live; Tavis Smiley; and in his own PBS Special, The Answer Is You and is a member of Oprah’s prestigious inaugural Super Soul 100. Every Friday at 1pm PST, thousands tune into his radio show on KPFK, WAKE UP! The Sound of Transformation.